Bolivia passes law to save pink freshwater dolphins, scientists want an ecological corridor to protect jaguars in Mexico, and more evidence that Patagonia was a landmass adrift 500 million years ago. Argentine scientists have found more evidence that Patagonia was once a separate landmass from South America. The discovery of 500 million-year-old Archaeocyatha, small reef-building animals similar to sponges, at Sierra Grande in central Patagonia confirms that the landmass was separate from South America and is the first documented discovery of these animals in continental Argentina. The morphology of the ancient sponges allows scientists to pinpoint when and where they were living: a region close to eastern Antarctica between 540 and 570 million years ago. Patagonia merged with South America sometime in the Paleozoic (between 250 and 550 million years ago) and after jutting up against the Andes was transformed from subtropical into the semi-arid landscape we know today. 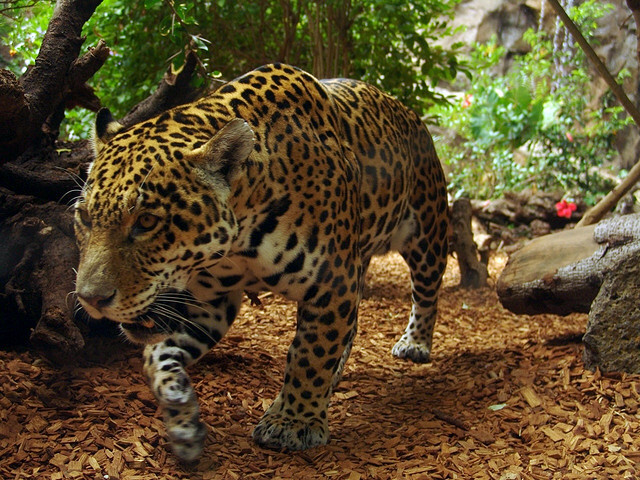 Scientists want to create a protective corridor for jaguars in Mexico’s Yucatan Peninsula. Credit: Joachim Muller via Flickr. The Juan Fernandez Archipelago lies 400 miles off Chile’s coast and is suffering from severe ecosystem degradation at the hands of introduced species, logging, and fires, says the University of Chile’s Cristian Estades. The archipelago, which likely inspired the book Robinson Crusoe, was declared a world biosphere reserve in 1977, though its endemic species are on the decline. “Forty-nine of the islands’ plant species and seven kinds of birds are classified as critically endangered by the International Union for the Conservation of Nature,” writes Eva Vergara of the Associated Press. Scientists say the fragile islands are overcrowded with invasive species and will require millions of dollars to stabilize and to save endangered native species. Ricardo Lozano, the director of Colombia’s national institute for hydrology, meteorology and environmental studies (Ideam) is asking Colombians to prepare for periods of severe drought that the El Nino climatic phenomenon could cause. Lozano pointed out that people should start saving water during the rainy months of October and November, especially in the agricultural sector, as droughts could last until February. Colombia has so far raised US$70 million for a natural disaster relief fund, created following the 2011 flooding disaster that affected 54,000 homes in Ubate, 100km north of Bogota. Many of Colombia’s provinces, or departamentos, are also at risk for wildfires, landslides, and heavy winds. Scientists in Mexico want to create an ‘ecological corridor’ on the Yucatan Peninsula for the country’s largest population of jaguars which numbers 1,800 cats. The project is being spearheaded by Gerardo Ceballos, a researcher at the Universidad Nacional Autonoma de Mexico who conducted Mexico’s first country-wide jaguar census. He is currently working in the Calakmul Biosphere Reserve to conserve the puma and the jaguar. The plans for the protective ‘corridor’ are part of a program called the National Strategy for the Conservation of the Jaguar which seeks to conserve that and many other species of flora and fauna in a series of protected reserves that would form a belt whose area would total 9,650 square miles-about the size of the state of Vermont. The Pan American Health Organization (PAHO) has released a study underlining Mexico’s obesity epidemic. With 39% of Mexican adults overweight and 31.7% suffering from obesity, the PAHO warns that Mexico is suffering from a “virtual obesity epidemic.” The PAHO–the regional office for the World Health Organization–points out that Mexico needs better organization of its healthcare system and should educate healthcare professionals depending on the needs of each sector. Currently, 14% of the Mexican population suffers from type 2 diabetes, which caused 78,121 deaths in 2009.